If you're looking for a broader digital strategy, then check out our objective marketing post here. Whenever “socialing” (not a real word… yet) I always seem to fall into a Facebook hole because I want to see what my personal friends, mother or sister are up to first; and before I know it something pulls me away before I get to Twitter or Instagram. 1. Invest the time you need to grow your followers. I estimate it takes only 5-10 minutes per day to aggressively drive your follower numbers. Of course, you have to be smart about your activities, which I’ll get to in just a moment. But you need to know up front that you’ll be committing to this daily if you want to gain followers at any meaningful rate. 2. Pick a few topics that interest you, that you have some credibility in (someone might actually tweet back or DM you), and that have a broad reach. 3. Follow thought leaders in those areas. Simply entering those keywords in twitter will produce a long list of accounts you can follow. A small percentage of these people will follow you back organically, and you’ll now see their content in your feed. 4. Follow companies that have a large user base or following in your target areas. I already followed a couple of the big dogs in my industry so I just had to start interacting with them more. For me it was Hubspot, Marketo, and Gartner. I know there are many more to choose from but I had to keep it simple and manageable. 5. Start tweeting regularly using your selected keywords and hashtags. I used a goal of 3 times per day. I never did less than 2 and many days I tweeted 4-5 times. I used the hashtags listed in point-2 above. 6. Find things to tweet about. It sounds very basic but it can confuse anyone who’s getting started or trying to grow their following. Here’s what I did: A) retweeted interesting articles, B) tweeted at people who posted something interesting, C) live-tweeted at people hosting or attending webinars I watched, D) interacted with my existing clients online, and finally E) I tweeted some random thoughts I had again using the keywords and hashtags mentioned above. 7. Follow your “suggested” people every day. You find this in the upper-left hand corner of the app. Each afternoon when I took a break I’d go through and follow almost every suggested person, many of whom followed me back almost immediately. I found the application is much more friendly to building an audience when you use their mobile application. The reason? It makes steps 8 and 9 substantially easier by the way it is organized and presented compared to the desktop/web application. 9. Follow your “popular” people every day. This is in the same section as the suggest people to follow. Although they’re less likely to follow you back (a couple may follow you back in a week’s time) they be a source of great content and interactions if you engage with them. 10. If someone interacts with you in any way, follow them. This goes for favorites, retweets, and @mentions. If someone interacts with you they’ll almost always follow you back. 11. Be ready for what’s coming. When you follow the steps above, you’ll get some good follows, some bad follows, some new friends, and some DM spammers. But either way, make sure you’re checking the app regularly so if someone sends you an honest message, question or inquiry you don’t miss it. Remember, Twitter is a fast moving machine. 12. Use CrowdFire’s free mobile app to prune your list. Some unscrupulous characters will be quick to follow you, only to drop you immediately after you follow them back. Oh, it’s on, m****** f******s! I don’t do this and I recommend that you don’t either; Twitter is a community after all. One thing you can do to rid yourself of these people is use CrowdFire’s free version to cut up to 100 people per day who don’t follow you back. It’s not cruel. Remember, they did it to you first. BONUS TIP: Friday is your friend! If you employ these strategies and tips, but you miss a day here and there because you’re human make sure it’s not on a Friday. Follow Fridays (#FF #FollowFriday) is a day in which people are more likely to tweet out your handle if you interact with them. This will get you up to a 30% lift in additional followers that day over your daily average. However, make sure you share the love and tweet out some of your new followers as well. The last thing I’ll say is that if you’re a B2B marketer like me make sure you have a plan that is driving all of these ideas and activities. Having the wrong keywords or interacting with the wrong companies might feel good at the time and generate some buzz, but if doesn’t serve a defined purpose you may very well be wasting your time. I would estimate that by the end of the forth day, Thursday of that week, I was averaging a new twitter interaction every 15-20 minutes using only the activity I described in the beginning. Not only did I increase my following by 263, I also achieved a percentage gain of 178% because I only started with 337 followers. Imagine the growth someone would achieve if they followed these steps but started with 500 followers, or ever 1000. If you liked this post, be sure to follow me on Twitter for more social, digital, and marketing information. See what I did there? P.S. If you want to grow your audience (and who doesn't? 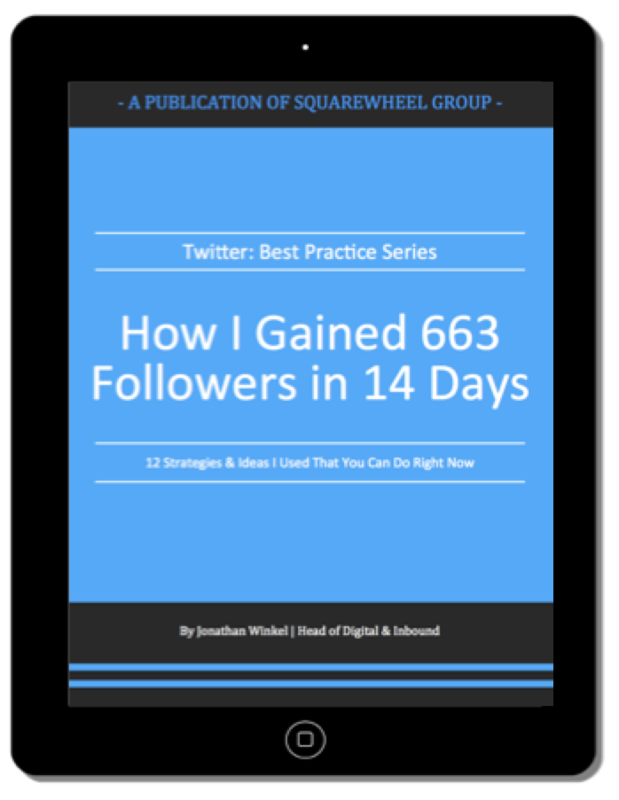 ), get our eBook on how to "Get 663 Twiiter Followers in 14 Days"